In ambiente cluster Windows ho avuto la necessità di eseguire dei task solo sul nodo owner di un particolare cluster group. Con Windows 2003 era possibile rendere anche il Task Scheduler una risorsa cluster; per Windows 2008 non ho trovato una guida analoga. 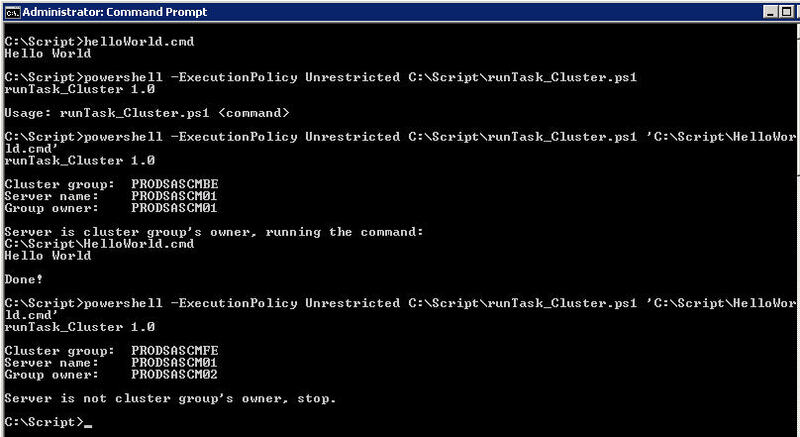 Write-Host "Server is cluster group's owner, running the command:"
Write-Host "Server is not cluster group's owner, stop." I like this script but I can’t get it to work. I get the following error. Got any ideas? 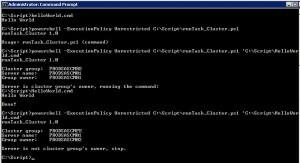 Get-ClusterGroup : An error occurred opening the clustered service or application ‘JAGUAR2′. Server is not cluster group’s owner, stop. I fixed it. the name of the cluster group was incorrect, once I fixed that the script works. great, thanks for sharing your experience!